GNSI has developed a few different awards in order to honor various kinds of extraordinary work done by Guild members. The Special Projects Award was established in 1994 and is given occasionally for (unpaid or grossly underpaid) major projects. [Last person to get it was Britt for Sciart.com. Before that it was Norm for the NL.] 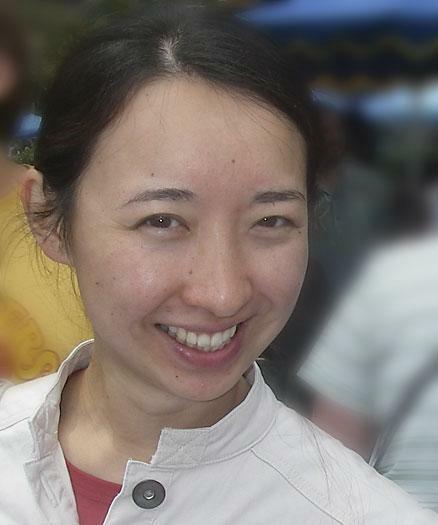 This year GNSI awards the Special Projects Award to Ikumi Kayama for her work in designing, producing, analyzing and reporting on a comprehensive membership survey. In 2012 the Board determined that, in order to serve the Guild better, more information was needed about the membership. Ikumi, who was by then on the Board as Recording Secretary, created a preliminary survey, which she gave to people at the Business Meeting at the 2012 conference in Savannah: captive audience! Ikumi put the survey online while providing a paper copy to anyone who had trouble with the online form. She then actively bribed members to participate by promising GNSI jewelry — a lapel pin — to anyone who completed the survey. List-serv participants may remember several exhortations to complete the survey, complete with suggestions of jewelry. It worked! 150 people filled out the survey, a major miracle in the history of the Guild’s efforts to collect this sort of information; [I believe that a previous survey collected 4 answers]. As the resulting JNSI article points out, at 25% of the membership, this provides a good statistical confidence in the answers. Ikumi then reported the results to the Board, which continues to make use of this valuable information. And she wrote an article for the Journal summarizing the information (this last with the help of an intern and Britt). It appeared in the first issue of the Journal for this year. When not dreaming up survey questions and bribing people to answer them, Ikumi can be found as the principal medical and scientific illustrator of Studio Kayama, which specializes in illustration, animation, graphics and web design. Her work has appeared internationally in juried shows, exhibits, textbooks, scientific journals, presentations, television shows, and websites. This year alone she has been involved in 15 surgical textbooks. She holds a Master of Art degree in Medical and Biological Illustration from Johns Hopkins University School of Medicine and a Bachelor of Fine Arts degree in Scientific Illustration from the University of Georgia. Ikumi contributes to the working of the Guild in various ways. As a Member of the Board since 2010, she cannot get away from the survey as it guides the Board’s efforts. She has been a GNSI member since 2005, has coordinated digital content for meetings at least 4 times, coordinated an exhibit and catalog for her chapter, DC. She can be found in many venues, including here at GNSI teaching PhotoShop. The auction is beholden to her knitting prowess. Ikumi writes: “GNSI is something special. I’ve been to other conferences and organization meetings, and no organizations come close to GNSI when it comes to friendliness, openness, and humbleness. [Ikumi] wishes to share that first excitement she felt when she first attended the conference with as many scientific illustrators as possible."